I was amused and proud to see my latest book The Wandering Who held aloft by Israeli chief Sayan Hilllel Neuer at the UN’s Human Right Council. The book was presented as ‘exhibit B’ in a farcical self-appointed Talmudic kangaroo court against the great Professor Richard Falk who lent his name, amongst many other leading humanists and intellectuals, in support of my work. Infamous Hasbara spin-doctor Neuer doesn’t like Falk, this is clear. Along the years Zionists have developed a collective anathema towards humanists and humanism. 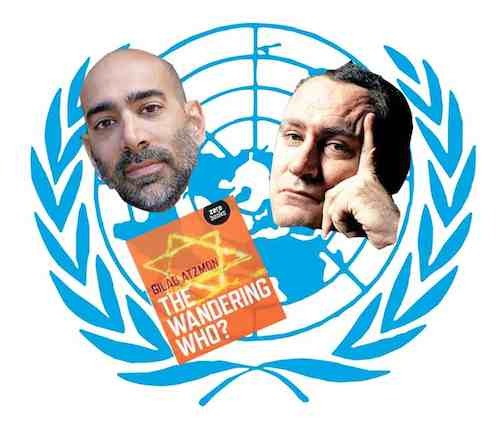 Neuer Insisted that The Wandering Who is ‘Anti-Semitic.’ In order to support his ridiculous claim, he recruited Ali Abunimah, the man who single-handedly managed to reduce the Intifada to an electronic blog. So here is some bad news Neuer better take into consideration: 24 hours before Abunimah published his peculiar ‘interpretation’ of my thoughts, he was foolish enough to admit to Professor Norton Mezvinsky that he actually had not read The Wandering Who or “anything else by Atzmon.” How embarrassing. At the time, Professor Mezvinsky, gave me his full consent to publicise Abunimah’s confession. In his relatively short intellectual career, Abunimah has managed to produce some of the most mind-boggling statements in the history of contemporary intellectual exchanges. I guess that Neuer could do with the support of someone who is familiar with my work or at least clever enough to hide his ignorance. But here is another problem Neuer should pay attention to: The Wandering Who is now published in more than 10 languages. I guess that by now, leading Zionist legal experts spent enough time and energy trying to discredit the book. Yet, in spite of the effort, no one has found a single piece of evidence of racism or anti Semitism in the book. In short, The Wandering Who is indeed very critical of Jewish identity politics, it is critical of Israel, Zionism and even Jewish "anti-Zionism", and yet, it is 100% free of any racism or anti Semitism. In other words, funny enough, it is Kosher. I guess that Abunimah and Neuer are maintained by the same kind of guys. Like many Palestinian NGOs including the BDS, Hillel Neuer Human Rights Watch is also funded by Liberal Zionist George Soros’s Open Society Institute. Hence, it is far from a big shock to find that Israeli agent Neuer recruits electronic Abunimah in his bitter fight against Prof. Richard Falk, the world leading advocate of Palestinian human rights. The only question that is left opened is how Ali Abunimah feels about it? I would like to hope that he is embarrassed by it all, but I won’t be surprised if he isn’t.